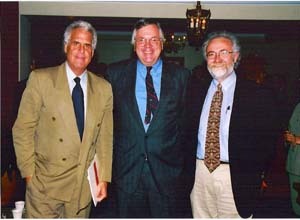 Institute Board member Dr. André Dascal at right with Board member John F. Angus (c.) and guest Howard Scott at Institute meeting. Dr. Dascal's full professional profile will be posted shortly. why this strain is more virulent." 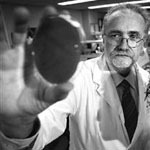 MONTREAL - Scientists at Montreal's McGill University have cracked the genetic code of a highly lethal strain of the C. difficile superbug that has claimed the lives of as many as 2,000 Quebecers since January, 2004. The sequencing of the entire genome of the Clostridium difficile bacterium should pave the way for a quick genetic test to diagnose those infected with the microbe, researchers said yesterday. The information could also lead to potentially new treatments for C. difficile-associated diarrhea. "Just as knowing the letters of the alphabet underlies the ability to read and write, this discovery will provide scientists with the basic information needed to understand why this strain is more virulent," said Andre Dascal, associate professor of medicine, microbiology and immunology at McGill. The <?xml:namespace prefix = st1 ns = "urn:schemas-microsoft-com:office:smarttags" />Quebec strain, taken from a patient in 2004, is 3.9 million DNA bases long. The McGill scientists spent more than a year unraveling C. difficile's genetic mysteries, and had to rely on a high-speed sequencing technology at Washington University in St. Louis to complete the work. European researchers have already sequenced another strain of C. difficile, taken from a Swiss patient in 1982. However, the Quebec strain is believed to be much more virulent. The Quebec strain is resistant to a class of antibiotics called fluoroquinolones. Someone who is exposed to the bug, perhaps picking it up from touching a toilet seat, can become colonized by it in the gut. At present, hospitals obtain stool samples from patients and grow bacterial cultures to check for C. difficile. This could take up to two days. Knowledge of the bug's genome will probably lead to a genetic test that could be performed in just an hour, Dr. Dascal said. "The test may also be able to tell you whether it's a nastier strain than the other ones," he added. "As a consequence, should we be treating strains which are more aggressive in different fashions? My personal belief is that there might be a role for that -- that the more aggressive strains might require different drugs than the less aggressive ones." Doctors now treat C. difficile disease with the antibiotic of last resort, Vancomycin. Dr. Dascal said a PCR genetic test could be manufactured by a commercial enterprise in as little as a year. The sequencing has yielded some preliminary results. The Quebec strain is 10% smaller than the older European version. "Size isn't everything," Mr. Dascal remarked wryly. The McGill researchers suspect the Quebec strain might also produce hardier spores that can survive on surfaces much longer than C. difficile has in the past. That might be the reason hospitals have had such a difficult time eradicating the bug from surfaces in washrooms. The number of C. difficile infections has dropped in Quebec, suggesting hospitals might finally have contained the problem. However, Dr. Dascal cautioned doctors won't know for sure until the middle of winter, when the incidence of C. difficile infections is typically higher.